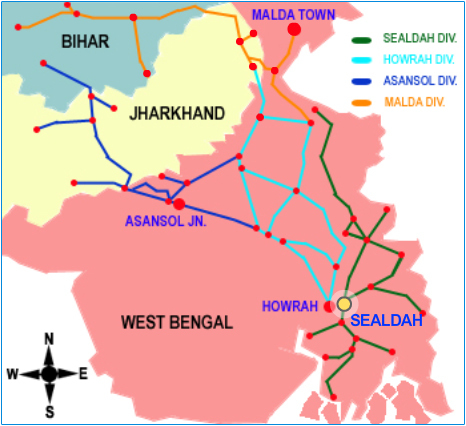 The Railway network under the jurisdiction of Sealdah Division earlier formed the western part of the Eastern Bengal Railway. 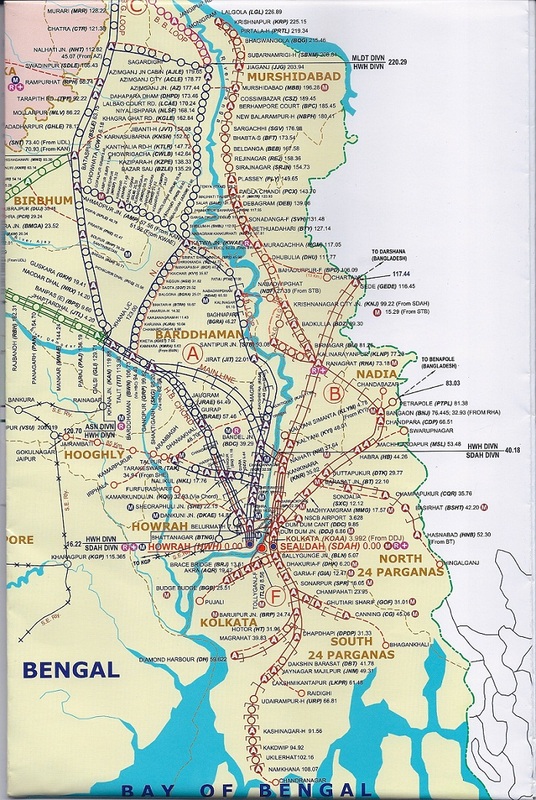 The Eastern Bengal Railway was formed after the State acquired the lines owned by the Eastern Bengal guarantee Railway on 1st July, 1884 and amalgamated with the North Bengal State and South Eastern Railways. On 1stJanuary, 1942, Assam Bengal Railway and Eastern Bengal Railway were amalgamated to form Bengal Assam Railway System which was divided according to the political boundaries and Sealdah Division became a part of Eastern Railway on 14.4.52 after reorganization. The Section between Kolkata (presently Sealdah) to Ranaghat was opened on 29.9.1862 and the section between Ranaghat – Darshana (now in Bangladesh) was opened on 7.8.1897. Serving six major districts of the state of West Bengal, the division covers the geographical land mass between river Hooghly on the West, Bangladesh on the North Eastern sides and Sundarbans on the Southern flank. Kolkata is the Central Business District of West Bengal. The flow of passengers’ traffic is basically centralized towards Kolkata. The Sealdah terminal is more or less situated in the heart of Kolkata City and thus the Sealdah station itself plays a major vital role in management of suburban traffic. Kolkata, Barrackpore, Diamond Harbour, Dakshineswar, Krishnagar City, Nabadwip Ghat, Murshidabad, Plassey, Shantipur etc. attract visitors in large numbers throughout the year due to their historical and religious background. Sealdah has two terminal complexes viz. Main / North corridor and South corridor. The main corridor is further divided into three spurs from DumDum Jn. One towards Dankuni, second towards Naihati –Ranaghat-Gede, Krishnanagar – Lalgola and third towards Bangaon –Barasat-Hasnabad. In the South Budge Budge line takes off from Ballygunge station. Canning section starts from Sonarpur whereas branches from Lakshmikantapur – Namkhana and Diamond Harbour take off from Baruipur. There is linking between north and south via Kankurgachi – Park Circus chord. Kolkata Terminal was inaugurated on 30th January, 2006 by Hon’ble M.R., which handles mail/express trains and is also linked with the circular Railway. Dum Dum Jn also plays as an important terminal where Metro and Circular Railway terminates. There are 32 terminal stations other than Sealdah where trains originate/terminate according to the need of the commuters.